Palmer Johnson revealed its 35m Carbon Sport superyacht design during this year's Monaco Yacht Show, and now its design team shares more details about the concept with Boat International. 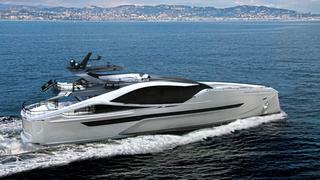 The new 35m yacht boasts an efficient hull form that maximises living space. The design is reminiscent of the US builder’s Super Sport 48m, with sponsons – for extra stability, reduced roll and increased beam aft – and a muscular superstructure. The 48 Super Sport was announced at last year's show; the 48's hull and superstructure is complete and she on track to be delivered in 2013. The new design has a radically different layout to the 48 Super Sport, with the owners' suite on the lower deck rather than the main deck. It also maximises the beach club space with a fold-down swim platform, while sunken seating on the foredeck gives the yacht another living area. The main aft deck has a beam of just under nine metres, with exposed sides under the haunches creating an unusually open feeling to the space. The 35m Carbon Sport design accommodates 10 guests (plus additional accommodation with two pullman berths) and five crew members. It would carry a five metre tender plus two Jet Skis and offer storage for loose beach club furniture. Volvo IPS 1,050 or IPS 1,200 engines are expected to yield a top speed of 30 knots and a range of 1,600 nautical miles at 16 knots.